I came to Korea with the knowledge of how to knit my own socks along with a bunch of sock yarn. The first couple of months I spent making socks and then making my own socks losts it’s luster. So here I was with lots of sock yarn and no idea what to do with it. Then it hit me, scarves!! I made up the pattern and I was so pleased at how they turned out. I made one for Jeff but forgot to take a picture of it but here is Jennifer with her’s. They are easy to make and with all the wonderful sock yarn colors you can never grow tired. Sock yarn is pretty much nonexistent in Korea but luckily I had a stash. 1. Cast on 76 stitches. 4. Repeat step 2 and 3. 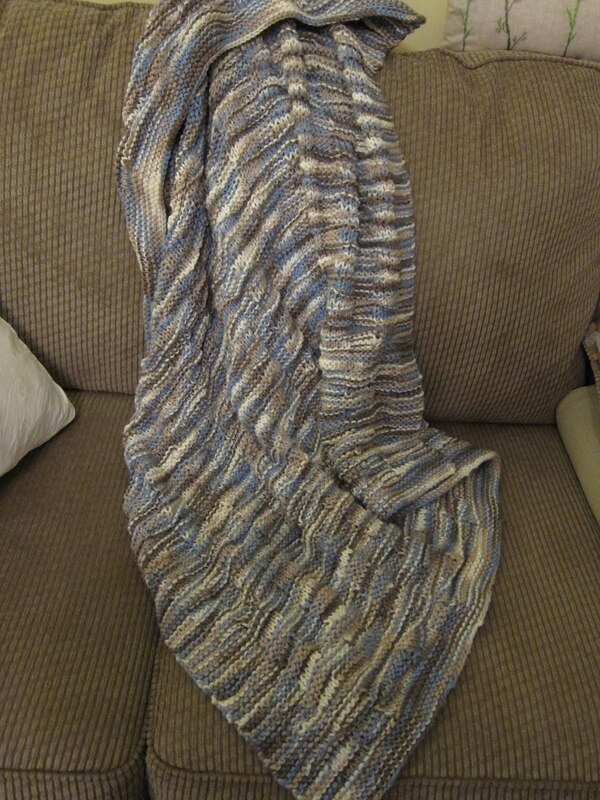 I used the whole skein of yarn and that made a scarf one yard long. I’ve been knitting and procrastinating on just about everything else in my life. I should be doing more with regards to the move. We had a Comcast remote die and it’s been sitting here by the computer all week and I just haven’t felt like calling Comcast. I should be making a list of the things I want to take to Korea and a shopping list of what I need to buy. I should do laundry more than once a week and the same with the ironing. Should of, would of, could of. But all I seem to want to do is knit. I finished this blanket for our new grandchild. We find out on Friday if it’s a boy or a girl. It is also the mommy of the new baby’s birthday. How could our baby girl be turning 26! I’m also fighting a virus that has kept my stomach upset most of the week and hot flashes have reappeared in my life. Thank goodness it’s winter. It’s snowed every day for the last 10 and it’s snowing today again. Still waiting on that final signature and it’s driving Rocketman mad. I have an interesting story about Rocketman. Since we’ve been back from Korea, I’ve tried to find our safety deposit box keys to no avail. I had some car titles from the cars that I wanted to put into it. I called the bank last month to schedule having the keys redrilled. I tried three separate times and they always vowed they would call me back. Finally I had Rocketman take over and they listened to him right away and he met the drill guy at the bank yesterday. Come to find out, we had closed the safety deposit box right before we left for Korea. Rocketman felt like a fool and so did I. Why didn’t they check that when I called all those times. Luckily, the gal had some work for him or I think we may have had to pay the $150.00. I swear my brain just isn’t working like it used to. 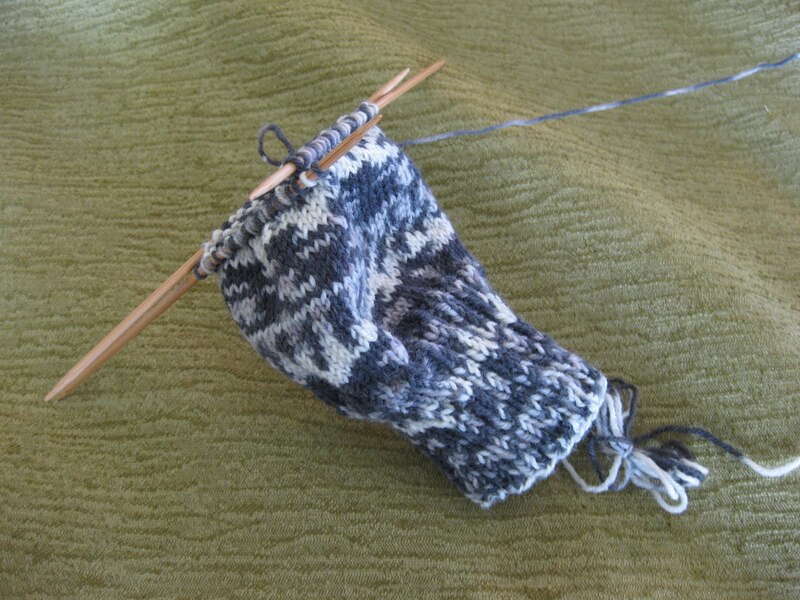 This is what I’m working on at the moment, socks. Lots of socks. I have about four different pairs going all at once. I’m having trouble making the heel and have been getting alot of help from my knitting instructor. I’ll come in on Wednesday either with a problem or a sock that I have ripped apart and can’t get going. She patiently picks up my stitches and helps me to continue. I think I finally got it but I’ll let you know after I have a few more socks done. I do love the colors of the sock yarns. I am using Opal Sports for the yarn. I have a thought that I would make socks for the family for Christmas but we will see how busy I get this year. The verbal approvals have been made for our move back to South Korea and now we are waiting on the formal approvals through the company’s computer system. Rocketman is getting very impatient with it all and I don’t blame him. There is a lot of pressure for him to get back to Asia and he is putting it off knowing this move could be approved any minute. I should be deciding on what I want to take to South Korea but instead I’m busy knitting. a new one. I had the furnace guy out and even though we weren’t in immediate danger, with such an old furnace it was on borrowed time. So I talked to Rocketman and we decided to take advantage of the Fed Rebate of $1500.00 and get a new high efficiency furnace and air conditioner. It’s going to be installed next Tuesday. Our computer has been giving me a lot of trouble and Rocketman finally decided what he wanted and ordered it last week. On Sunday, our computer decided it didn’t want to power up. I tried all day to no avail. The new one showed up on Monday, the same day the furnace decided not to work properly. The day was stressful and I was about to call the Geek Squad when I decided to say another prayer and turn on the computer. It powered up!!! I couldn’t believe it. So I am not turning it off until the new one is up and running. Poor Rocketman has to take all the information on the old one and put it onto the new one. To relieve my stress I’ve been knitting. 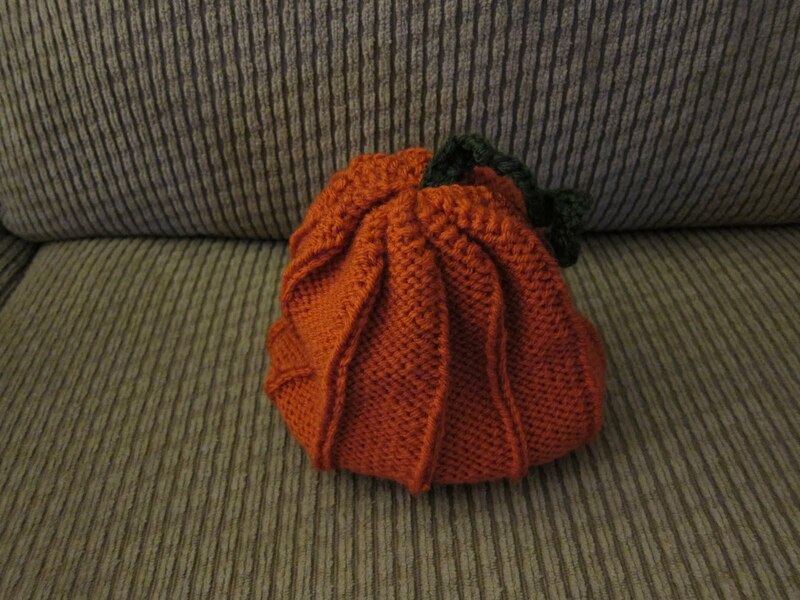 I made the pumpkin hat above for the little grandbaby that is coming in June. It really does help to keep my fingers busy. I had my weekly knitting class today and everything I had done was ripped out. You would think that after making one sock the mate would be a piece of cake. Well it’s not! 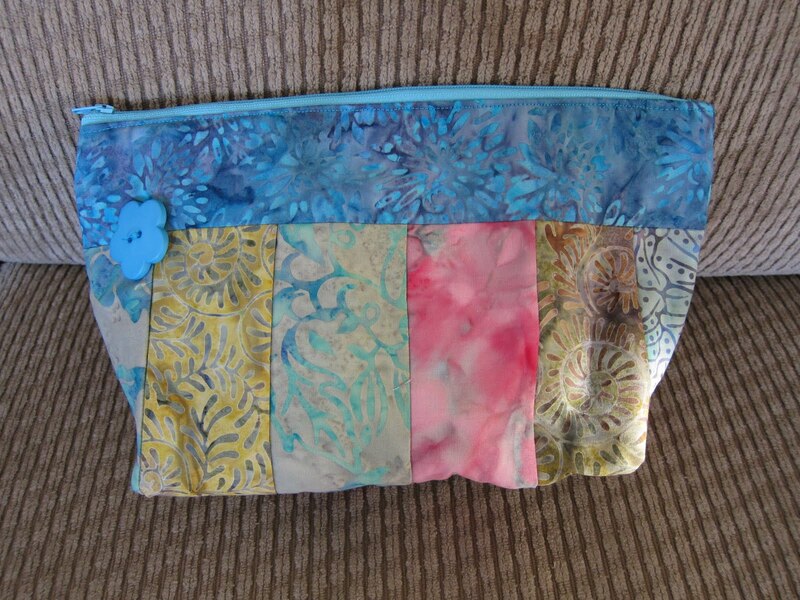 I also took a class at my local quilt shop and made this snazzy purse. The pattern is for three different sizes and I love how it turned out. I added a JHB button to top it off. It was a fun class and since there were only two of us, it went pretty fast. If I had time I would make a couple for gifts this year but I think I will have to put that on my list for next year. I finished my sock. It included two emergency trips to the yarn shop for help but I was able to finish it up the last day of class. My teacher has an ongoing Wednesday morning class where you bring what you are working on or questions and she’s there to help. Today was my first day and I was surprised and happy to see a gal from my sock class. She is still working on her first sock. 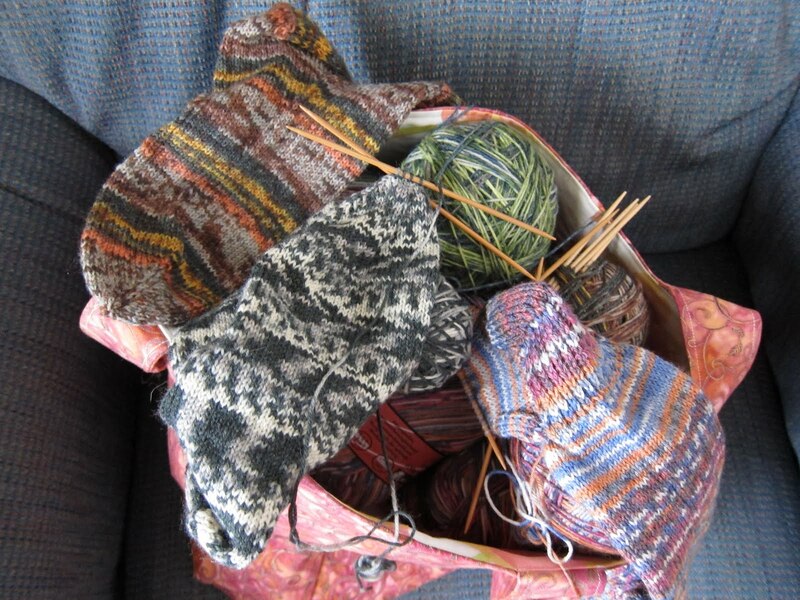 You would think that since I had completed one sock that the second one would be a breeze. Wrong! I feel like I didn’t learn a thing. Eileen, my teacher, is so patient with me and also very encouraging. I bought another set of needles to begin to work on a second pair of socks. I thought it would be a great idea to make two sets at the same time. I have a feeling I will be taking this Wednesday class a very long time. It’s a great way for me to get out and meet new people. The class is two hours long and the time flies with the knitting and talking that goes on. I have an enameling class tonight and am very excited. 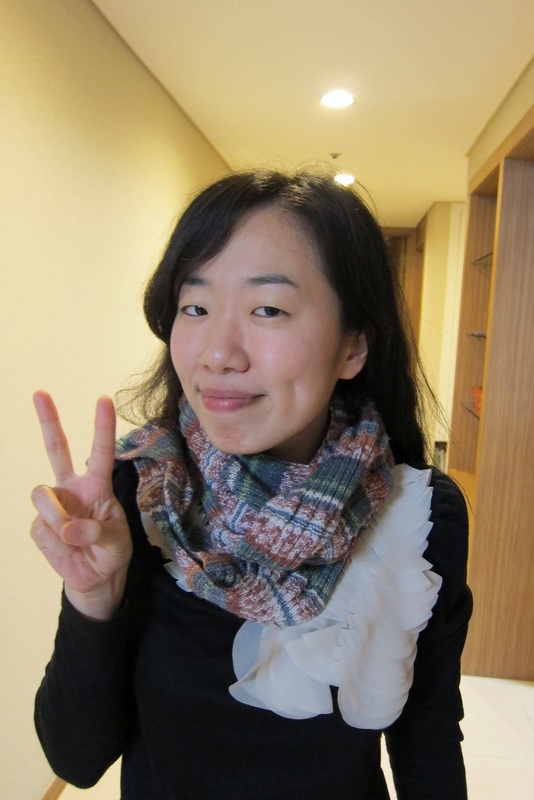 I found Sarah’s Korean blog a few years ago when we moved to South Korea. She has been living in South Korea for over 10 years. She is married to a most handsome Korean and they have the most darling little girl, Grace. We became friends through the Internet, sharing the joys and trials of living in South Korea. She knew many of the things I was dealing with because she had to deal with the same things. Sarah is a fellow crafter and I learned much about her through her blog. She is an amazing knitter among other things. The things she has made are truly remarkable. I hadn’t knitted in over 20 years but seeing what Sarah was doing gave me the itch. So I signed up for a sock class at my local yarn store and last night was my second of three classes. The class is pretty full at eight of us. I love watching the ball of yarn I chose create such a beautiful pattern. Last night I was at the heel of my sock and was sitting next to my instructor for directions. I was following closely to every word she said. She told me, “Turn Becky,” so I stood up and sat more at an angle. The teacher and whole class started laughing like crazy and that’s when I realized she meant for me to turn my sock NOT my body. I was so into listening and following her instructions exactly that it never occurred to me that she was talking about my sock. Everyone in the class wants it to continue past next week since a lot will not have even completed one sock and the instructor is open to it. I sure need more than 3 weeks to make a sock. 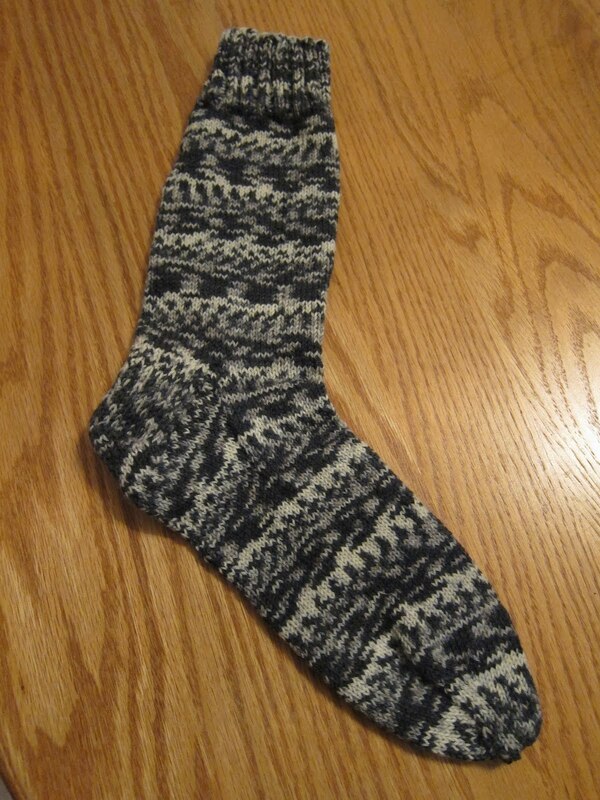 I would also like to make the second sock. I am having so much fun with the other ladies who’s ages range from the 30’s – 70’s. I miss getting out and meeting people. So I want to thank Sarah for reintroducing me to knitting. I’m loving every minute of it even though I forget to breath sometimes when I’d doing something that takes a lot of concentration. If you want to check out Sarah’s blog, click here.